Statistics indicate that 1 to 6% of the general population is allergic to natural rubber latex, and in rare cases, reactions can be so violent that they are fatal. Unnoticed wear and tear on diving equipment can have unexpected effects, as in the case of the regulator bungee necklace. Usually they occur when the latex allergens touch the skin. Even in people with no latex allergy, contact with these allergens over an extended period could cause them to become highly sensitive. When thinking of diving equipment and latex, the first thing that comes to mind is drysuits, which usually have latex wrist- and neck-seals. Opting for a drysuit with silicone or neoprene seals would seem to solve the problem, but sometimes latex can be found in unexpected places. 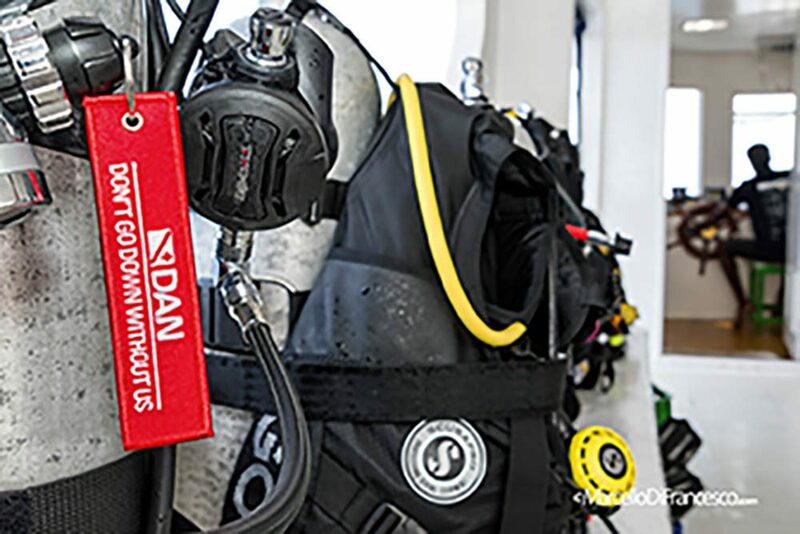 As recreational divers, we’ve all seen the relatively new fad of using a regulator bungee necklace, a practice that actually started a long time ago with technical and side-mount divers. What this slightly pretentious name describes is simply a piece of rubber cord with a couple of fishermen knots, worn around the neck to hold the alternative air source in position. The advantage is that, in case of an emergency, the octopus will be very easy to locate and use. All you have to do is put a hand under your chin, much easier than groping around your BC. It’s so simple that most divers prefer to make their own bungee necklace at home. The DAN case report of a 49-year-old Australian technical diver living in the USA reveals that there can be a curious downside to use of such necklaces. The man travelled to Nevada for a dive show with his dive-buddy, both of them having thousands of dives under their belts. The day before the show, they decided to take some photographs of an underwater canyon at a depth of 45m in Lake Mead, choosing the side-mount configuration, each with twin tanks one either side and two sets of regulators to use alternately. They used air and nitrox 50, and their dive lasted 39 minutes, including deco. The Australian diver wore a double necklace around his neck to keep both regulators to hand. He had used this configuration for around 100 dives. The man had eaten dark chocolate before the dive, and had a couple of beers after diving. He started feeling a certain numbness on the left side of his upper lip, and within half an hour his face started swelling visibly. By dinner-time the whole left side of his face was swollen and filled with liquid, though he was feeling no pain and could eat normally. The swelling persisted for an entire day before starting to get better. When the diver called DAN, the doctors immediately suspected some kind of allergic reaction. After inspecting all his equipment, their findings indicated that the bungee necklace he had used was worn out. Some rubber filaments emerging at either end of it had come into contact with his face, causing what was a pretty serious allergic reaction. He was tested for allergies and indeed proved highly sensitive to latex, as found in the filaments of the bungee necklace. What can we learn from this story? That our diving equipment should always be in perfect condition, even if we don’t even suspect that we have allergies. Experienced divers in particular tend to overlook this key aspect: safety needs to be our top priority, no matter how many hours we’ve spent under water. Too often we get lazy and forget that, to avoid problems, even small and apparently insignificant pieces of equipment, such as a bungee necklace, get worn out over time and need to be replaced. Always better safe than sorry! The 2017 case report Acute Facial Swelling in a Recreational Technical Diver by Peter Buzzacott, William K Dolen and James Chimiak can be found online in NCBI Physiological Reports.